A small fraction of the fuel oil, which consists of hydrocarbons, will pass through the engine unburned and other hydrocarbons are formed during the combustion process. The hydrocarbons are thus mainly particles of unburned and partly burned original fuel. Lubrication oil also contributes to the emission of hydrocarbons. Hydrocarbon emissions can be a variety of different configurations with different contents of for example H, C, N, S and O and in different sizes from methane (CH4) to longer hydrocarbon chains. Gaseous and non gaseous hydrocarbons are distinguished by the following: Gaseous hydrocarbons are those that exist in gas phase at a temperature of 190°C. At lower temperatures some hydrocarbons condense into liquid or solid states. Some large hydrocarbons with high molecular weight are the so called complex aromatic structures. Included in the group of aromatic structures are the Polycyclic Aromatic Hydrocarbons (PAHs). Emissions of HC are normally largest at low loads and idling, where combustion can be incomplete, and become more or less constant at loads above 50% of MCR as can be seen in Figure 43. 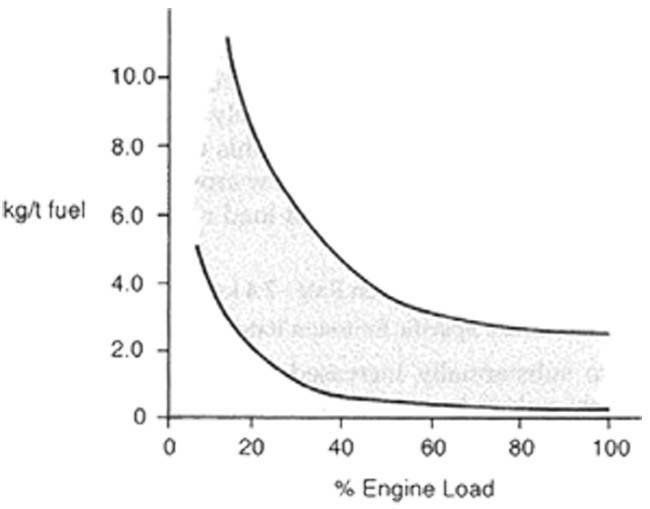 At low loads over lean fuel air mixtures exist and here the fuel does not ignite during the fuel injection. Over fuelling is another source of hydrocarbon emissions. Where zones of over rich fuel air mixtures exist combustion will also be incomplete. Later in the combustion process when the hot gasses are mixed some of the initially unburned fuel may burn completely or partly. HC emissions are thus greatly influenced by the condition of the engine and a badly maintained engine with worn valves and injectors; bad engine timing, fouled air filters etc. can increase HC emissions drastically. Within shipping particularly oil tankers pose problems with hydrocarbon emissions through their pressure relief valves on the cargo tanks. These hydrocarbons are normally described as Volatile Organic Compounds (VOC). Figure 43 – Hydrocarbon emission rates as function of engine load for diesel engines. Hydrocarbons take so many different shapes and appear randomly in liquid, solid and vapour phases which make them difficult to quantify. The same is true to their impact of human health, which depends on the actual composition of the hydrocarbon. Some hydrocarbons can also be categorized as particulate matter. Methane constitutes a large part of all HC emissions and currently the concentration in the atmosphere in increasing. Since the Global Warming Potential (GWP) of CH4 is much higher than for CO2, it has been suggested that within 50 years methane may overtake CO2 and be the principal GHG. In general HCs are accused of causing a broad range of adverse health effect like drowsiness, eye irritation to more severe cases they can be mutagenic (increasing the frequency of mutation in an organism) and carcinogenic (causing cancer). Benzene (C6H6) is known as a carcinogen, and the larger and more complex polycyclic aromatic hydrocarbons are also known as being carcinogenic even when present in very small quantities. Other hydrocarbons again might not be as harmful, but can still cause eye irritation and respiratory problems. Non methane HC (the VOCs) can also be involved in photochemical reactions leading to formation of ground level ozone and smog when exposed to sunlight by reacting with NOX.